I am granting the Grayling Visitors Bureau, the Grayling Regional Chamber of Commerce and Huron Pines permission and the right to publish (and/or) post my contest entry/entries to the internet or in a print publication completely free of royalty. I agree to forever hold harmless the Grayling Visitors Bureau, the Grayling Regional Chamber of Commerce and Huron Pines from any liability caused from the publishing or posting of submitted entry/entries for the contest. I understand and agree that digital images must be submitted as a JPEG with at least 300 dpi or higher. I understand and agree that each entry must be an original photograph or video in its entirety taken by myself, the contest entrant. The contest is open only to amateur photographers. I agree that I was granted permission by any subjects in my entry/entries to use their likeness in my photograph or video. I agree that all photographs and videos were taken in Crawford County, Michigan and that I have indicated the location the entry/entries were taken. I understand that CDs or flash drives will not be returned. 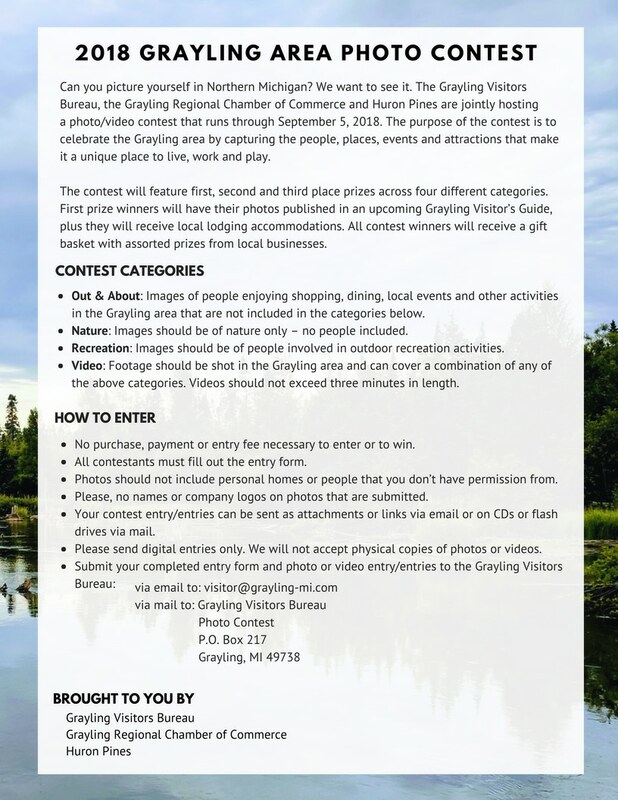 Grayling, MI—The Grayling Visitor’s Bureau, the Grayling Regional Chamber of Commerce and Huron Pines are jointly hosting a photo/video contest that runs through September 5, 2018. The purpose of the contest is to celebrate the Grayling area by capturing the people, places, events and attractions that make it a unique place to live, work and play. The contest will feature first, second and third place prizes across four different categories. Out & About: Images of people enjoying shopping, dining, local events and other activities in the Grayling area that are not included in the categories below. Nature: Images should be of nature only – no people included. Recreation: Images should be of people involved in outdoor recreation activities. Video: Footage should be shot in the Grayling area and can cover one or a combination of any of the above categories. Videos should not exceed three minutes in length. The Grayling Visitor’s Bureau, the Grayling Regional Chamber of Commerce and Huron Pines are hosting this contest to promote the local attractions, natural beauty and recreational opportunities found in the Grayling area. “We love to see people enjoying our beautiful area, and often publish photos that Visitor’s send to us. We use photos for ads in local newspapers, regional magazines like, Adventure Outdoors, Michigan Trails, Bird Watchers Digest and RoadRunner and on travel websites like Pure Michigan and West Michigan Tourist Association. People that submit entries, even If they aren’t the winning entries, can expect to see their photos or videos still appearing years from now,” says Ilene Wilson, Executive Director, of the Grayling Visitor’s Bureau. First prize winners will have their photos published in an upcoming Grayling Visitor’s Guide, plus they will receive local lodging accommodations. All contest winners will receive a gift basket with assorted prizes from local businesses. The contest is open to amateur photographers and videographers. You can find full contest details along with rules and regulations and the entry form at www.grayling-mi.com/photo-video-contest. 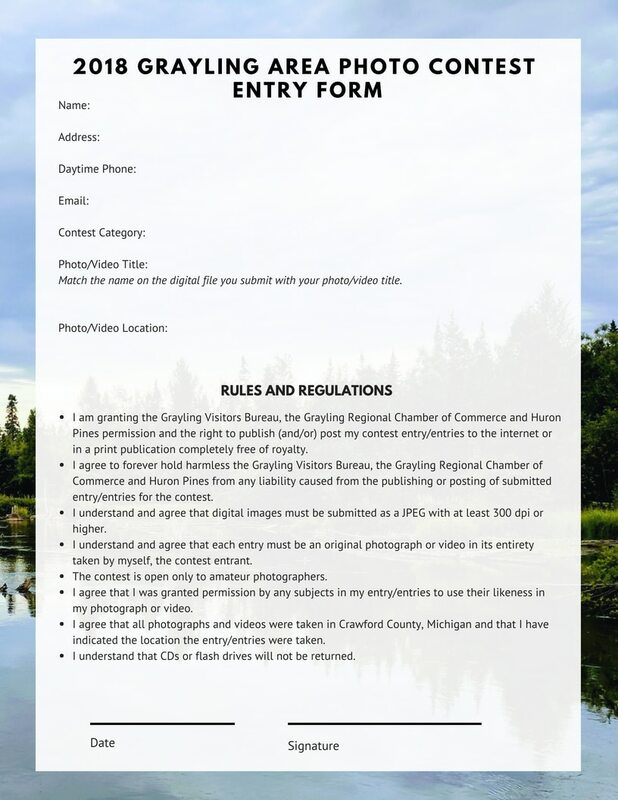 To enter the contest, download the entry form and send the completed and signed form along with your submissions to the Grayling Visitor’s Bureau at visitor@grayling-mi.com. For visitor’s Information, check out www.grayling-mi.com and Facebook at Grayling Visitors Bureau. Visit www.graylingchamber.com or call 989-348-2921 at any time for Crawford County and Chamber Member information and a list of upcoming chamber, chamber member, and community events. Huron Pines is a 501(c)(3) nonprofit organization and an equal opportunity provider with a mission of protecting the Great Lakes by conserving the forests, lakes and streams of Northeast Michigan. Huron Pines believes that through active leadership and coordination of conservation projects we can support stewardship of the water, wildlife and community in the places we live and love.